So, last question first: yes. I know what you’re thinking—that I totally dropped the ball and didn’t realize that Labor Day weekend came a week later than usual this year, and booked my non-refundable flight and non-refundable hotel room a week too early—and you would be correct! But that is only half the story! See, sometimes, I can actually be an optimist. And you now what? It can pay off. So there I am last Thursday, thinking to myself, “you know, what’s done was done. Heck, I’ve got the ticket, I’ve got the hotel, and I’ve got the vacation time. Screw it. I’m gonna make the most of this anyway.” And let me tell you guys—it was the best decision of my life. Because I discovered something this weekend. Something amazing. Guys, there’s a Secret DragonCon. No, really! There’s an entire DragonCon that goes on a week before DragonCon! Did anyone else know this? I guess not, because there were only a few people at the Marriott but I could tell they were in the know, too. I mean, look: what’s the biggest complaint about DragonCon? Too many people. You gotta wait two hours on line just to get into a panel. None of that at Secret DragonCon! I didn’t have to wait on any lines. Okay, I didn’t actually go to any of the panels—who does, really? We all know Secret DragonCon is really just a big party, right? Plus, none of the panel schedules were listed on the DragonCon app. Oh. Crap. I bet there was a secret Secret Dragon app, wasn’t there? God, how meta! I can’t even be angry now! I will say I was a little disappointed by the merch room. I’m not a huge collector or anything, so thankfully I was looking for any rare item in particular, but I still expected just a little bit more. I mean, a lot of the stuff on the shelves were just toiletries and pens I could get at a CVS without that famous “con markup.” And it was kind of weird how everything had the Marriott logo on it. But I still got to take advantage of some con exclusives, guys! Right around the corner there was a guy selling DVDs of the latest Mission: Impossible movie. Guys, that movie’s still in theaters! How cool is that? You know the best thing about Secret DragonCon? It’s discovering that a lot of celebrities care enough about their fans to come an entire week in advance to make an appearance at the Walk of Fame! You know who I met on Sunday? Eddie Money. For real, guys! Eddie freakin’ Money was at the Walk of Fame! Just hanging outside the Walk of Fame entrance at the bar near the Hilton lobby. He was super nice too! He didn’t have any more 8×10’s but I had a pad of Marriott stationery I bought from the merch room and got it signed. “Baby hold on, Two Tickets to DragonCon! Love, Eddie.” And he only charged me forty-five bucks. Great guy. Secret DragonCon is great, guys! So here’s my advice: get to Secret DragonCon before it gets too big. One week before Thursday is the new Thursday, but only until everyone knows about this and starts making it a thing. In fact I’ve already booked my hotel for Secret DragonCon next year! I’ve got a suite at the Westin all ready to go for a week and a half before Labor Day. You guys want in? Guys? No? Alright, I’ll check in again with you guys later. Anyway, I’m gonna go unpack and… well what are all those bags for? 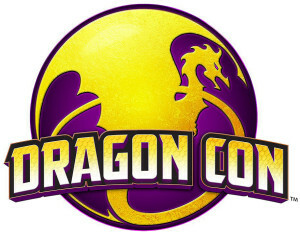 DragonCon logo © DCI, Inc. This entry was posted in Essays and tagged DragonCon by August J. Pollak. Bookmark the permalink.